A friend recently told me a funny story. She had been contacted by an acquaintance who had recently moved to Sweden with her family and, in the run up to Halloween, she was looking to find her local pumpkin patch. Being a seasoned immigrant to Sweden my friend was stumped. She knew what a pumpkin patch was but the question implied a serious misunderstanding of cultural differences between this acquaintances expectations and the actual customs of the country she had just settled in. The “Halloween” represented by Jack ‘o’ Lanterns, witch’s hats, and ghouls has only been present in Sweden since the late 1980’s and has rapidly grown in popularity. 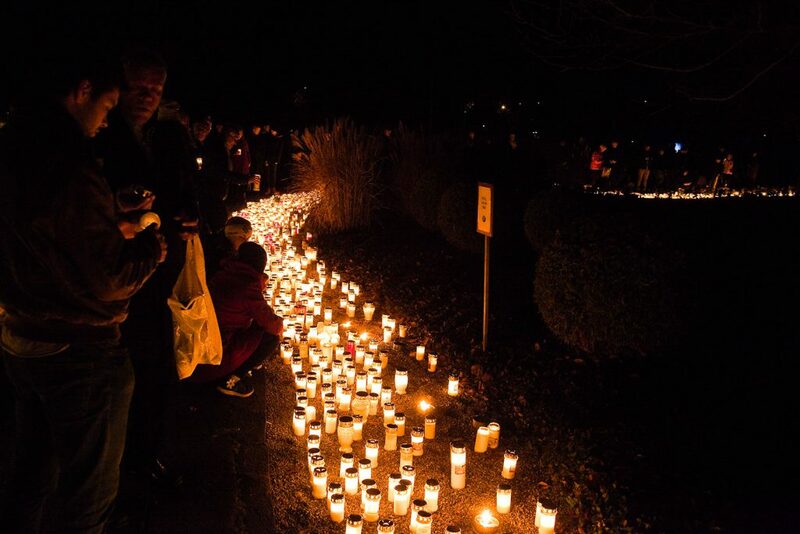 The celebration of Allhelgonadagen or All Saints Day is the traditional “All Hallows” celebration in Sweden. It takes place on the Saturday and Sunday between the 31st Oct and the 6th Nov. It’s a time for remembrance and honouring those who have passed on. It also marks the beginning of winter time. Family members visit their relative’s graves, en masse, to leave wreaths and candles to honour, remember and celebrate loved ones. It’s roots are in 16th century Catholicism. We took part in this celebration for the first time 3 years ago and it was one of the most moving experiences I’ve ever had. We spent the weekend in Uppsala with our family and visited Uppsala old cemetery on the evening of Allhelgonadagen. Uppsala old cemetery or Gamla Kyrkogården is just off Engelskaparken and dates back to the 1600’s. Headstones dating to that period loom over the more modest and modern gravestones . By late afternoon, the cemetery was lit by a thousand candles and relatives gathered around head-stones and large crypts silently remembering or quietly talking. Some were visibly grieving and some were happily reuniting with friends, long forgotten. As we slowly walked along the paths that wove in and out of the plots we overheard snippets of conversations, anecdotal stories and saw remembrances play out before us. We stopped to take in the image of the winding path of light that snaked through the cemetary and up into the church yard. 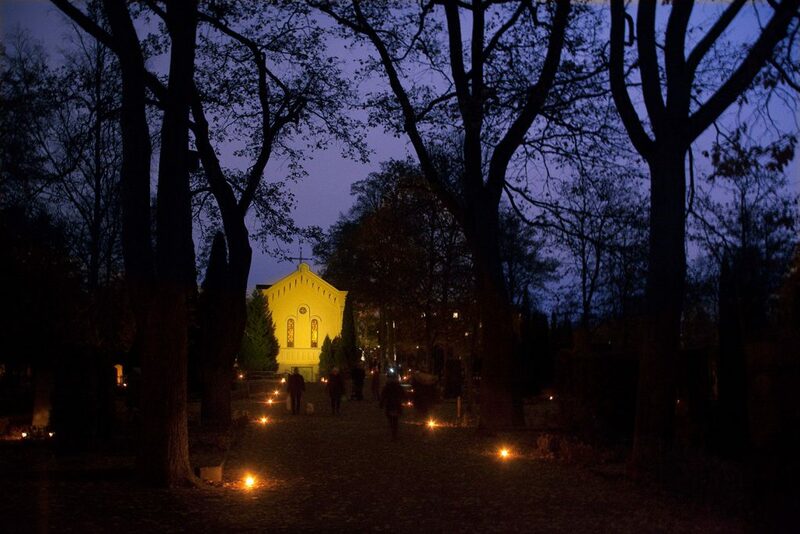 The avenue leading to the centre of the cemetery was lit by the old Stillhetens Kapell (Serenity Chapel), an older chapel that now serves as an orthodox church. From the chapel came the most incredible chanting. It was surreal, like a film but even more beautiful! At a spot on a commemorative wall we stood for a few moments reflecting on time and the volumes of people celebrating their loved ones. We lit our candles and placed them alongside the thousands of other dancing lights that would remain lit for as long as nature would allow. Despite Stella being too young to understand what was going on the celebration was of immense importance to her Swedish family. I hope we continue to celebrate it, too. It was a touching experience for me. I don’t tend to think of myself as spiritual or moved by recognised faith. Nevertheless, the care and peace that I saw left an impression. If you’re interested in taking part in All Saint’s Day in your local area, check out your local church’s schedule of events. If you would like to read more about Allhelgona read more about it on the Swedish Church’s website. For more information about Halloween in Sweden, events and activities in Stockholm throughout Höstlov and Allhelgona, click the links.